The best, safest, cleanest way to burn incense! No longer do you have to worry about ashes on the table or floor, or some child or pet knocking over the incense boat or bumping into hot tips! Your answer is here! Just light your incense stick, clip it on the split ring that we provide, and drop it in the bottle to hang. It's that easy! Smoking Bottles are the coolest, cleanest, safest way to burn your incense! Indoors or outdoors, they work great, leave no ashes, and are very attractive. 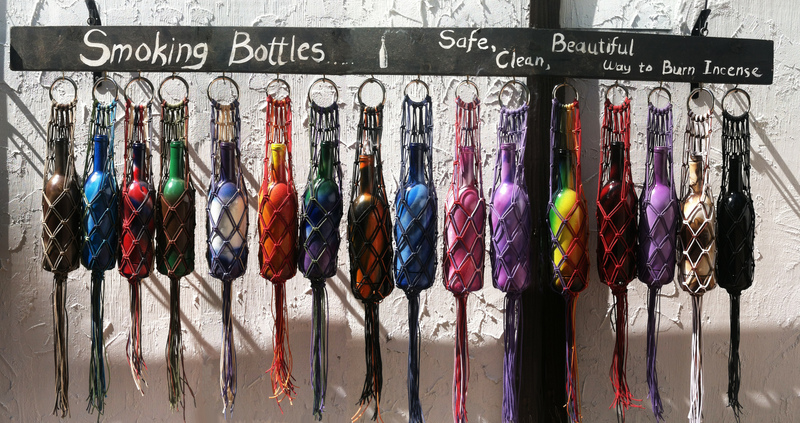 Each bottle is hand painted, and hung in a waxed cotton cord hanger. I don't know who came up with the idea of cutting a hole in a wine bottle and hanging a stick of incense inside, but it's a great idea. But we didn't like that the bottles could so easily be knocked over when sitting on a shelf or table. So we started trying to figure out how to hang these smoking bottles. We tried several different ways, but none seemed right. My father, Dave Kelly, has spent his life fishing, and when you fish at some poin you need to repair your nets. So he created a jig and made this macremed hanger using a waxed cotton cord. As so our Hanging Smoking Bottle was born! We've been selling them since about 2001 and they seem to be getting more popular as the years go by. Each bottle is $24.00 and comes with 20 free incense sticks of your choice. Use the button below to type in the incense of your choice to go with your Smoking Bottle. It will add one cent to your shopping cart, and will be ignored if your order does not include a Smoking Bottle. We've divided up the Smoking Bottles by color scheme, so as to make your browsing easier. Each design has it's own shopping cart button, so when you click you will be ordering that specific design. There are untold number of color designs, so we will be adding them as time goes along.